Many fans know that starters were often also used as relievers in the past. Lefty Grove, for example, only started 30 games the year he won 31 games (in 1931). He came in 11 times as a reliever. In 1930, he won 28 games while starting 32 and coming in to relieve 18 times. On May 23, 1911, Christy Mathewson pitched a complete game victory giving up only 1 earned run. Then on May 26, he pitched the last 1 and 2/3 innings to get a win. When he came in in the 8th, the Phillies had two men on and had just scored 2 runs to tie the game. Then he got a double play. The Giants scored 2 in the bottom of the 8th and Mathewson pitched the 9th for the win, giving up no hits. The next day he pitched a complete game shutout. The first column shows the % of games pitched in relief by the leaders in starts. That would be the top 480 in games started in a season for the 1920s, for example. So in that group, 19.5% of their games were in relief. 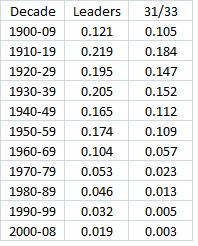 The next column shows the % of games pitched in relief by pitchers who started at least 31 games (up to the 1950s) or 33 games since the 1960s. The trends are pretty clear. 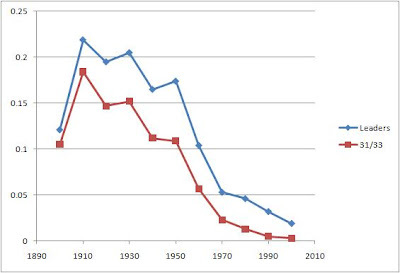 The graph below shows the percentages over time.